With a career in finance that began in 1951, Charles “Mike” Murphy had seen marginal banking practices over the years that turned out to be disastrous for customers and companies alike. In founding Murphy Bank in 1984, (we first began operations as Sierra Thrift) he was determined to provide high quality, honest banking services to customers in the Fresno area, and he put systems in place to ensure that reality. To continue to be recognized as one of California's best specialty banks with a focus on small businesses and individuals, emphasizing customized services to busy people through long term relationships. Standard practice in the banking industry is to set goals for projected financial growth and then require that these goals be met. In order to meet the set goals, money is often loaned out that should not be and problems with these loans begin to appear. Murphy Bank operates differently. Quality loans — those that will benefit both the borrower and the bank — are identified. Only then are funds generated through certificates of deposit and savings accounts. This process has enabled Murphy Bank to establish long term lending relationships with excellent customers while also paying a premium rate of return on its savings products. All funds deposited in Murphy Bank are fully insured by the FDIC. For the founding management team, Mr. Murphy selected Jim Templeton, Richard Laxton and Paul Heath. In 1989, Mike Falge joined the bank as a loan officer, and quickly became a key contributor to the bank's continuing success. When, Chairman of the Board, Mr. Murphy retired in 2001, Mr. Templeton became Chairman of the Board and Mr. Falge was unanimously voted in as President replacing Mr. Templeton at that position. Mr. Murphy passed away November 2016 and left behind the bank he had always dreamed of creating. His daughter, Brigeen Houghton, who has served on the board since 2001, was named Chairman of the Board upon Mr. Templeton's retirement at the end of 2014. Matthew Lim, CPA was brought into the Murphy Bank family in 2013 and at the end of 2014 made a seamless transition into the CFO position formerly held by Mr. Templeton. It is worth noting that all three of the founding management team are still leading the bank, though Mr. Templeton's role consists of serving as a board member and advisor. Paul Heath is in the Fresno branch and Richard Laxton is heading up the San Luis Obispo branch. 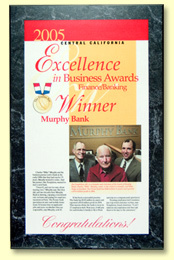 The current management team at Murphy Bank is fully committed to assuring the continuing of the Murphy Legacy. Its succession plan includes having in place the next two generations of management. This is only successfully done by continually hiring the right people, those with the highest integrity, and then training them and giving them ever increasing authority and management responsibilities. Murphy Bank's Fresno branch has been located at Fig Garden Village since 2002. Having a large base of customers built up over several years of making mobile home loans in the San Luis Obispo area, Murphy Bank opened a branch office in San Luis Obispo in October 2018. In addition to a strong management team, Mr. Murphy believed that, for the bank to be successful, every employee had to demonstrate a willingness to do whatever was necessary to make the bank run right. By his example, he communicated the importance of every single job. As an example, prior to his retirement in 2001, every morning he would hoist the American flag and sweep the front walkway of the bank. Today, Murphy Bank is one of only a few companies in our community to have a flagpole in front of their business that proudly displays the American flag every day the bank is open. Mr. Murphy’s commitment to high ethical lending practices, personal integrity and respect for the value of employee contribution continues to foster a company culture that we feel is unique in Valley banking. Our selection by The Fresno Bee for the 2005 Excellence in Small Business Award was, for us, a public commendation of The Murphy Legacy. As such, the award continues to inspire us to provide the highest possible level of service to the people and businesses of our community.